The Etsy Wedding Divas Treasury Giveaway is back, with a twist! Join in on an exciting treasure hunt. 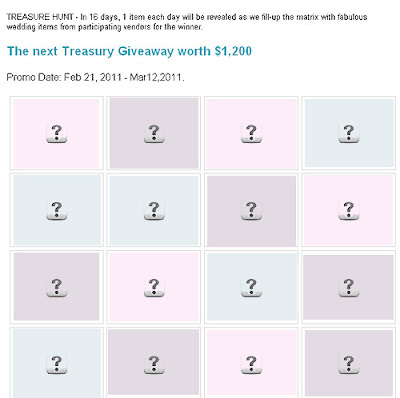 Starting February 21, 1011, one item at a time will be revealed, as a matrix is filled with fabulous wedding items ($1200) for one (1) lucky bride, from from our talented Etsy Wedding Divas vendors. 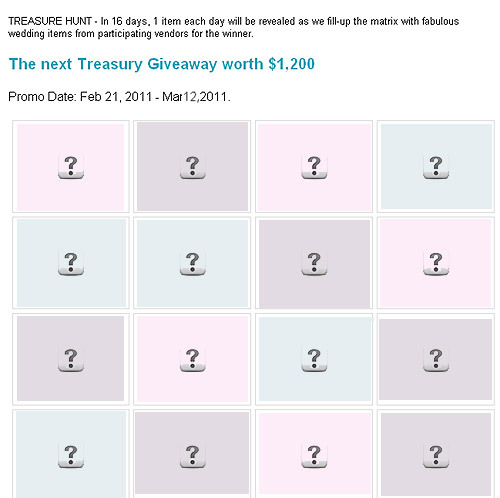 "Not just 1 item giveaway but an entire treasury!" Keep following Etsy Wedding Divas on Facebook, not only for the generous exciting giveaways but most of all for fabulous and creative handmade wedding products.